Fall Beers was the secret ingredient for the Spiked Recipe Challenge this time. 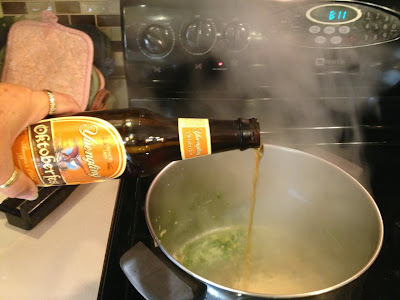 I chose to use Yuengling Oktoberfest Beer. When fall comes around I love to have soup and sandwiches. 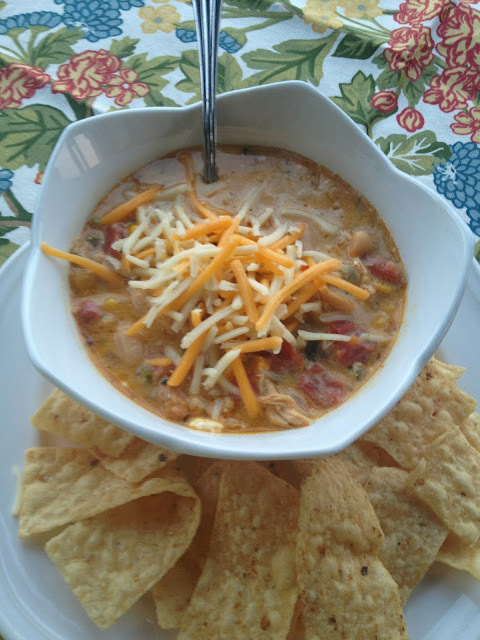 I wanted to make a spicy chicken chili. 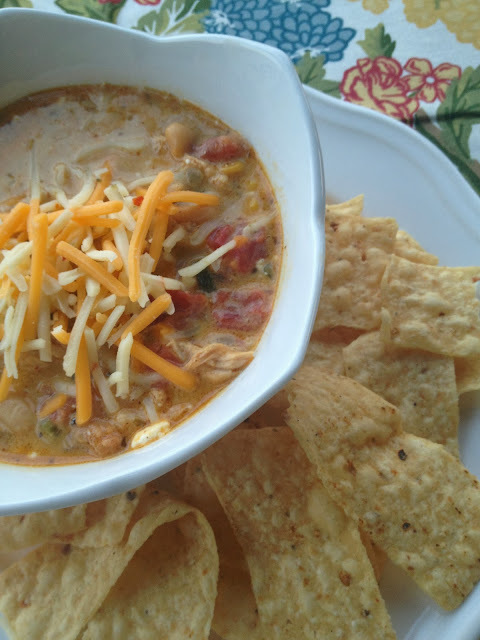 When I think of chicken chili I think of a white chili with great northern beans. I also like to crunch up tortilla chips to put in my chicken chili instead of crackers. 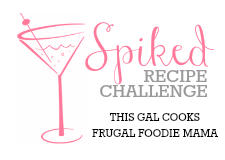 Make sure to go over to This Gal Cooks and the Frugal Foodie Mama to see all the other amazing beer creations! Heat some olive oil in a large sauce pan, add chopped onion, chopped jalapenos and grated garlic cloves. Saute until tender. 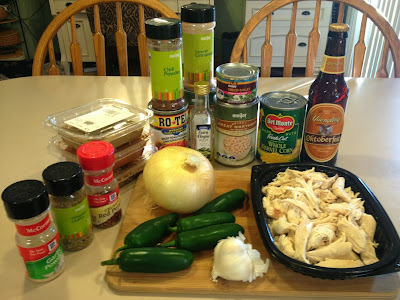 Add the Oktoberfest beer and continue simmering for about 5 minutes. 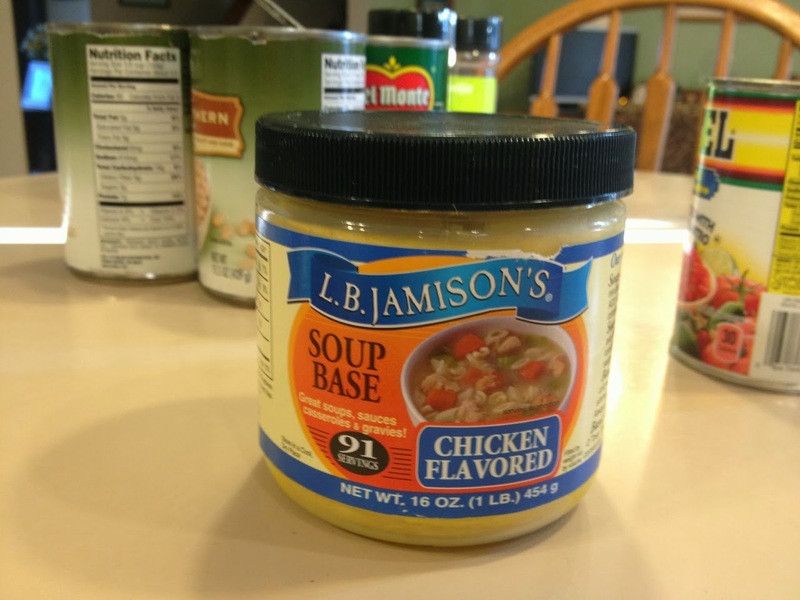 Add water and the soup base, continue simmering until the soup base is all melted and resembles chicken broth. Next add the rotel tomatoes, green chilies, corn, great northern beans and chicken. Mix into the chili all the spices (chili powder, cinnamon, oregano, cayenne pepper, cummin, and sugar) Continue to simmer the chili for 20 minutes. Just before serving stir in the whipping cream, sour cream and cream cheese until all melted into the chili. Serve with shredded Mexican blend cheese and crushed tortilla chips. This chili looks so yummy, Nina! :) And I loved that you used the Yuengling Oktoberfest! Yuengling is a local favorite around here, and I actually tried their Oktoberfest last week and was impressed. 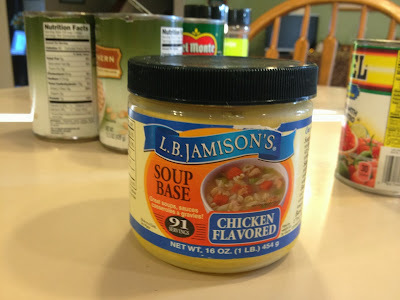 I added chicken broth plus 1 can of cream of chicken soup to make a larger pot of chili, also added 1 can of black beans for texture and color. I felt the cinnamon slightly over powered the flavor so I added a little more cumin. Next time I would use half the amount of cinnamon. Otherwise this was incredibly delicious and will definitely make it again!!!! Keep the recipes coming they are delicious!! !